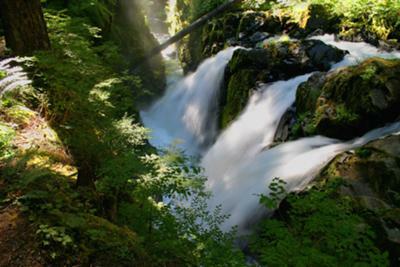 After a short hike, I reached Sol Duc Falls in the heart of the Olympic National Park. It was the second week in July, and the weather was nice and sunny. Had it not been sunny, my picture would have been quite different. As it is, it has lots of highlights where the sun shown down through the trees of the Olympic National Forest. It was a breath taking site never the less. A beautiful water fall indeed.